Vol 4 | Issue 3 | Sept-Dec 2018 | page: 26-27 | Marta Santos Silva, Tiago Barbosa, Ana Ribau, Jose Muras. Author: Marta Santos Silva , Tiago Barbosa , Ana Ribau , José Muras . Centro Hospitalar do Porto – Hospital Santo António, MD, Largo do Prof. Abel Salazar, 4099-001 Porto. Introduction: Leg shaft fractures are common, usually requiring a complex treatment, especially when they are open fractures. 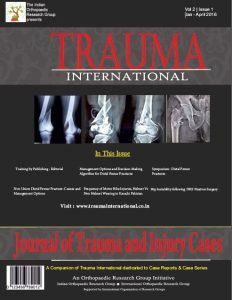 Case Report: This case report describes the presentation, surgical approach, and complications of a 32-year-old man, who suffered a motorcycle accident, resulting in an open bilateral tibial shaft fracture (Type IIIA + Type IIIB Gustilo-Anderson classification) and right calcaneal Sanders Type IV fracture. Conclusion: The clinical case illustrates the challenging treatment options, with an excellent clinical and radiological outcome. Keywords: Tibial shaft fracture, Osteosynthesis, Arthrodesis, Pseudoarthrosis. 1. Hungria J, Mercadante M. Fratura exposta da diáfise da tíbiatratamento com osteossíntese intramedular após estabilização provisória com fixador externo não transfixante. Ver Bras Ortop 2013;48:482-90. 2. McMahon SE, Little ZE, Smith TO, Trompeter A, Hing CB. The management of segmental tibial shaft fractures: A systematic review. Injury 2016;47:568-73. 3. Papakostidis C, Kanakaris NK, Pretel J, Faour O, Morell DJ, Giannoudis PV, et al. Prevalence of complications of open tibial shaft fractures stratified as per the gustilo-anderson classification. Injury 2011;42:1408-15. 4. Melvin JS, Dombroski DG, Torbert JT, Kovach SJ, Esterhai JL, Mehta S, et al. Open tibial shaft fractures: I. Evaluation and initial wound management. J Am Acad Orthop Surg 2010;18:10-9. 5. Hutchinson AJ, Frampton AE, Bhattacharya R. Operative fixation for complex tibial fractures. Ann R Coll Surg Engl 2012;94:34-8. 6. Märdian S, Giesecke M, Haschke F, Tsitsilonis S, Wildemann B, Schwabe P, et al. Treatment of tibial non-unions – state of the art and future implications. Acta Chir Orthop Traumatol Cech 2016;83:367-74. 7. Melvin JS, Dombroski DG, Torbert JT, Kovach SJ, Esterhai JL, Mehta S, et al. Open tibial shaft fractures: II. Definitive management and limb salvage. J Am Acad Orthop Surg 2010;18:108-17. How to Cite this article: Silva M S, Barbosa T, Ribau A, Muras J. Open bilateral tibial shaft fracture: Case Report. Trauma International Sep-Dec 2018;4(3):26-17.